It will ensure that your sales and marketing activities are "customer-centric" rather than "company-centric"
It will ensure that your sales and marketing activities are repeatable, scalable, efficient and capable of being optimised. If a sales process is so great and can do so much for our small businesses, then what exactly is a sales process? 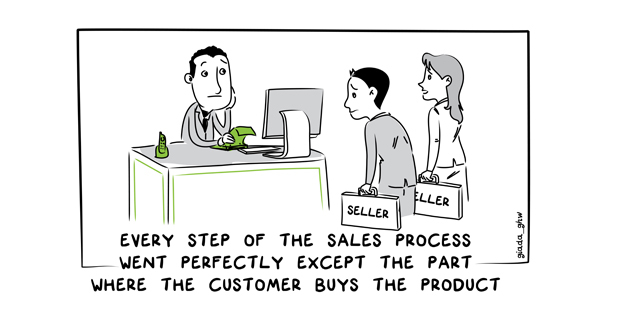 The truth is that every company has a sales process whether they are aware of it or not. A process is simply a series of steps to achieve a desired result and every business that has ever achieved a sale has followed some kind of process. However, the vast majority of businesses do not have a defined sales process. A well defined, optimised sales process might not be as essential in small ticket B2C sales, but in B2B sales and high value B2C sales like car or property sales, to not have a well defined, optimised sales process is to miss a huge opportunity. A sales process that does not start with a clear picture of who the customer actually is and how they typically reach their buying decisions is a sub-optimal sales process. Invariably, when our clients are having difficulties with their sales and marketing activities, it is because they have been selected from a company rather than a customer perspective. In helping our clients create a customer-centric sales process, we map out the typical customer buying process and then think about what the company could do at each of the stages in the buying process to address their needs and concerns. These activities then form the basis of the sales funnel through which we plan to move the prospective customer from initial awareness of your product and service all the way through to the act of purchase. Some things to watch out for in optimising your sales process is the linkages between each discrete step and that any marketing activity is connected at some point to this process. In my view, no small business can afford to do any kind of marketing activities that do not result in progressing the prospective client through to a closed deal. After we have selected our activities based upon what we believe will best address a customers needs and concerns at each stage of the buying process, we need to sequence these steps taken by the prospect and the sales team in order. The steps need to be sequenced in such a way so that time consuming and costly sales activities are reserved for the most qualified and high value prospects. Each step also needs to move a prospective client closer to a purchase, so that you can see at any time through looking at your sales process how close prospective clients are to purchase. This provides one of the greatest benefits of a sales process, which is greater visibility and therefore greater control over sales. Some clients answer my intial question of "what is your current sales and marketing process?" with something like "we use salesforce.com" or some other CRM system, web-based or otherwise. These systems are great for measuring and analysing what is going on in your sales and marketing efforts, but without a customer-centric sales process designed specifically for your business, you cannot measure or analyse anything but the most generic aspects of the sales process such as number of calls made, number of meetings held and number of proposals sent out. These generic measures are better than nothing but will certainly result in plenty of waste as they encourage such things as salespeople pushing prospects all the way to the proposal stage when they have weak buying intent just to keep the numbers up. In every market there will be unique and specific ways of introducing and selling products and services based upon the unique characteristics of the customer segment you are trying to serve. It's not enough to accept what many CRM system sales people say, which is in effect "if you don't have a sales process, take mine". This approach is not likely to work well as it is about as far away from being customer-centric as possible. It's not even a company-centric process, but rather a supplier-centric process which in my mind is a recipe for disaster. My experience is that the further the sales process is from the needs and concerns of the actual customers, the less successful it will be. That is not to say that a CRM system is not a good idea. However, it doesn't make sense to use a system designed to help you measure and analyse a sales process that doesn't exist or that has never been defined. The greatest benefits from a CRM system come when it has been configured to fit your specific customer-centric sales process rather than being used as measurement for measurements sake. Sales and marketing is not a magical art that cannot be defined or readily understood by the uninitiated. It is a business process, like any of the other processes in your business, except that the sales and marketing process is absolutely fundamental to business success. It therefore needs to be well defined, under control and aligned with the customer buying experience and overall business strategy. If you want to reap the benefits of a well defined, optimised sales process in your small business, then contact Continuous Business Planning today and take back control of your business.